Leader Spotlight is a monthly blog to showcase our incredible volunteer leadership at The Mountaineers. Meet this month's featured leader: Nancy Lloyd. She is a 12-year member from Olympia who is always working for the weekend and her next adventure outside! 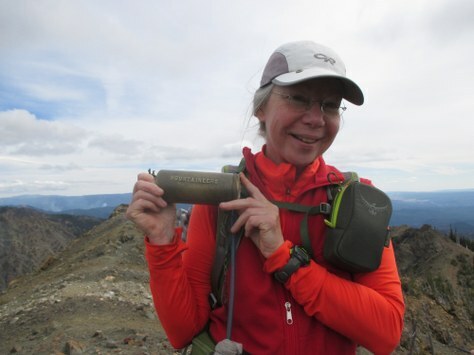 For our Leader Spotlight this month we talked to Nancy Lloyd, a volunteer leader with the Olympia Branch who loves spending time in the mountains and encourages leaders to set the right tone for their trip through thorough communication! My love affair with the Pacific Northwest mountains began in 1991 when I relocated to southwest Washington from New York City. I quickly became involved in two smaller outdoor clubs in the Columbia River Gorge area. I took classes and learned about hiking, backpacking, and climbing our local volcanoes. Eventually, I found myself assisting on climbs of Mt. Hood, Mt. St. Helens, and Mt. Adams. Within about five years, I was also leading my own hikes as well as ascents of those peaks and others in Oregon and California. Well, life happened and I moved to Olympia and joined The Mountaineers in 2007. I not only wanted to discover more wild places in this neck of the woods, I wanted to give others the opportunity to experience the joy of adventuring in the hills. Also, I love meeting so many interesting people from all of The Mountaineers branches. I have many favorite trips, but one that stands out is Mt. Adams. Its relatively easy accessibility provides a chance to summit a big peak in only a couple of days. For many folks on my trips, Mt. Adams was their mountaineering goal. I can't find words to describe the feeling I have after getting people to the top and seeing them shine with happiness and sense of accomplishment! I've grown a lot in the sense that speed and bagging peaks were more of a priority during my early years in the mountains. I still want to 'bag' peaks, but my priorities have changed. Now, it is more important to simply have a great time and make sure everyone in my group does, too. I try hard to travel at a pace that allows the entire group to be a cohesive team, we take photo ops, smell the roses, and learn from each other. I have also become more democratic by asking participants for input before making a decision; others often notice things or have knowledge that I may not necessarily have as the trip leader. Keep your group within sight of each other, even if it's 'only a hike,' but particularly if you are off-trail. I've had a couple of experiences where participants either went ahead or fell behind and no one in the group knew where they were. Nothing went wrong, but in the event of an injury or missing person, the safety of the entire group could be compromised. My rule of thumb is to tell participants this before getting on the trail: let's all watch out for each other and look back occasionally to make sure you see the person behind you. Also, clearly describe your pace, estimated trip time, and turn-around time before the trip starts to minimize surprises. Better yet, make sure trip participants understand what the trip involves before even leaving home. I have learned how important it is to keep everyone in the loop. In addition to having appropriate skills, you are the one who sets the tone on a trip. I can't stress enough the importance of communication. Make everyone feel welcome, encourage participants to engage with each other, have fun and a sense of humor! Also, be aware of each person and make opportunities to talk with everyone along the way. Generate trust. If someone appears to be having difficulty, have a friendly chat with him or her out of earshot of the rest. Maybe you could do something differently during the trip to make it more enjoyable for that person, and ultimately for the whole group. Getting outside is my lifestyle. The other 40 hours a week pay my bills and enable me to buy gear and put gas in the car so I can hike, scramble, camp, bike, ski, snowshoe, etc. Most importantly, I have made many wonderful friends for life thanks to The Mountaineers!